Splash pages, you gotta love 'em. A blank canvas where the artist can hit you with a large dose of illustrated 'wow'. This week, not surprisingly, it's Wonder Woman. Drawn by Jim Lee, and written by the man whose 'Dirty Diana' I would still kill to see, Frank Miller. 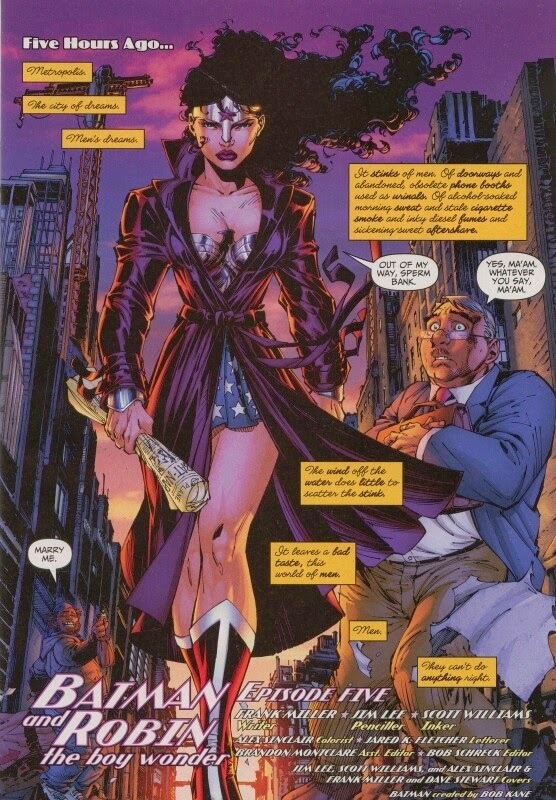 While kudos has to go to Lee for drawing Diana with Miller-ish hair and tiara, I've always ached as a fan to see Wonder Woman 'Franked'. While we got bits of her in DK2 and here in All-Star Batman and Robin The Boy Wonder, I still can't help but drool like the guys in this splashie over what the iconic creator would do with the most 300 of super-heroes, and all the layers her mission of peace bring to the Themysciran table. The thought boxes here and how she views Metropolis alone makes me want more. Lee, for my money, draws Wonder Woman best with a little more edge than she has had in the DCnU. This Diana here is one you'd pay to see go toe-to-toe with Jim's creation Zealot - and show her what a woman of warrior women can do. I loved the art - it was awesome! - but for me I did not like this iteration of Diana, she was very anti-men and extremely violent, in speech if not action. Even tho I also didn't like the dialogue between her, Supes and Bats, it was an amazing scene. But for all that. I would just love it if Jim Lee could draw her I the regular WW comic!